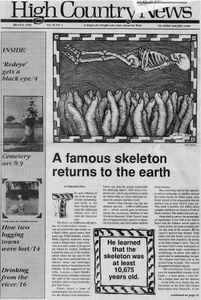 A paleoIndian skeleton is reburied in Idaho. An essay on growing up in Hilt, Calif., and Happy Camp, Calif.
An insect infestation in Taos Pueblo runs its course. Wealthy corporations control, and abuse, a disproportionate amount of available forage according to a National Wildlife Federation report. 'Ecoart! Earth Friendly Art and Craft Experiences' for 3 to 9 year olds is reviewed. An interstate water leasing plan proposal threatens agriculture on Colorado's Western Slope. Air Force flights from the Redeye Air Force Base anger local residents in Colorado. Essay on the role of western academics in policy decisions. Photographs from 'Scoring in Heaven: Gravestones and Cemetery Art of the American Sunbelt States'.